Essential oils and herbal extracts are nature's way of maintaining wellness. These natural ingredients are extracted with the greatest care from traditional plants and are blended by Swiss Herbalists to produce Olbas. Only the highest quality raw materials are used to ensure purity, potency and effectiveness. The soothing, wholesome goodness of Pure Wildflower Honey is blended with just the right amount of aromatic Olbas Oil and select Herbal Extracts to create this delicious Cough Syrup. Children and adults love the natural herbal-honey taste and you'll especially love the soothing natural benefits. 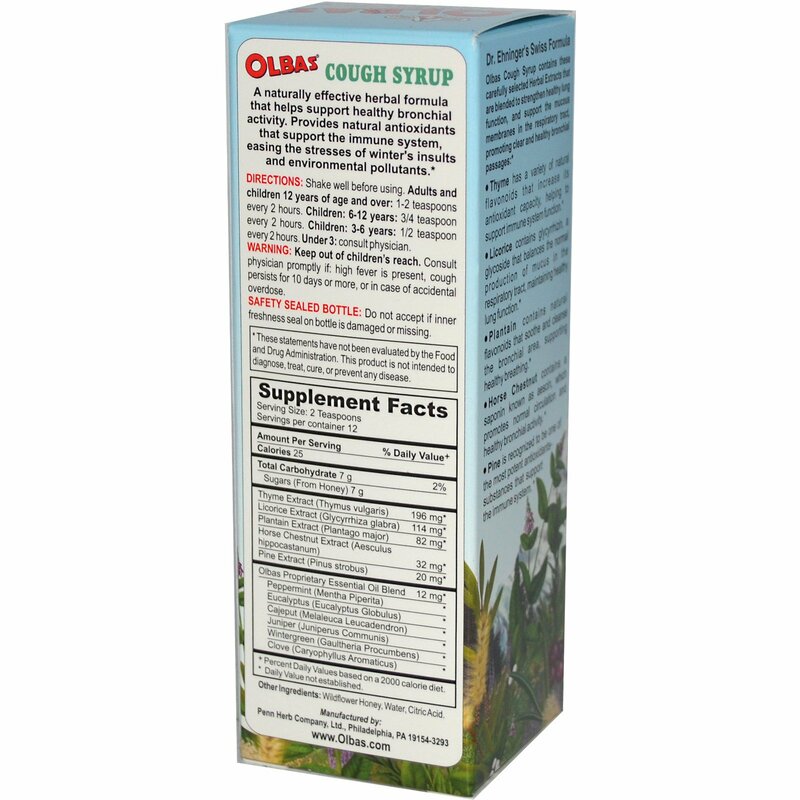 A naturally effective herbal formula that helps support healthy bronchial activity. Provides natural antioxidants that support the immune system, easing the stresses of winter's insults and environmental pollutants. Thyme has a variety of natural flavonoids that increase its antioxidant capacity, helping to support immune system function. Licorice contains glycyrrhizin, a glycoside that balances the normal production of mucus in the respiratory tract, maintaining healthy lung function. Plantain contains natural flavonoids that soothe and cleanse the bronchial area, supporting healthy breathing. Horse Chestnut contains a saponin known as aescin, which promotes normal circulation and healthy bronchial activity. Pine is recognized to be one of the most potent antioxidants-substances that support the immune system. Shake well before using. Adults and children 12 years of age and over: 1-2 teaspoons every 2 hours. Children: 6-12 years: 3/4 teaspoon every 2 hours. Children: 3-6 years: 1/2 teaspoon every 2 hours. Under 3: consult physician. Wildflower honey, water, citric acid. 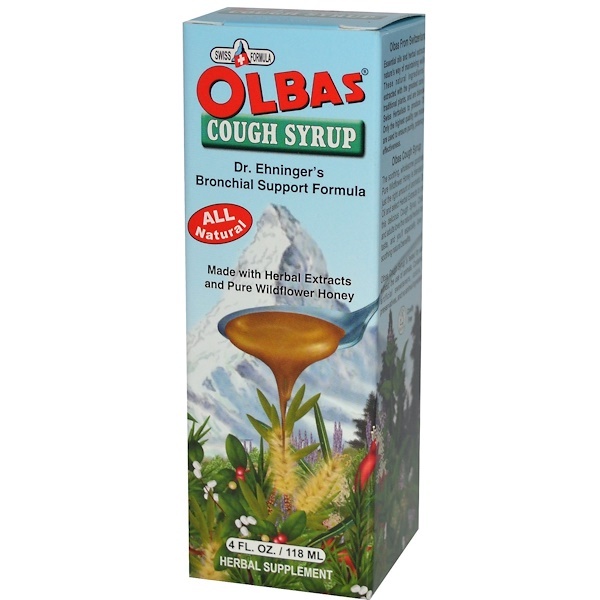 Olbas Cough Syrup is tested for safety without the use of animals. Contains no artificial sweeteners, colors, or preservatives and no animal ingredients. Keep out of children's reach. Consult physician promptly if: high fever is present, cough persists for 10 days or more, or in case of accidental overdose. Safety Sealed Bottle: Do not accept if inner freshness seal on bottle is damaged or missing. + Percent Daily Values based on a 2,000 calorie diet.